For me, the perfect short break is one that’s within a 2 hour flight from Manchester, has a quick transfer at the other end, includes a little bijou bolt hole to rest my head, a pool where I can take in the sun (that’s a must) and just enough on the doorstep to keep me as busy, or not, as I choose. A recent trip to Sóller in Mallorca with the hubby certainly ticked all the above boxes and more. Okay, I have to admit that a perfect short break doesn’t include a three hour flight delay, a plane full of over excited stags and hens and a very overweight man trying to wedge himself in to the very tiny seat next to the hubby. However, all this blurred into a distant memory as the doors of the plane flung open: like athletes under starters orders the hubby and I whipped our hand luggage from the overhead locker and were off. Our taxi was waiting and within 30 minutes we were being greeted by the smiling face of Vanessa and the wonderful Hotel Salvia, our base for the next four nights. Housed in a 19th Century mansion, the Saliva is located down a winding narrow street in a tranquil part of the old town, yet only a few minutes walk from the bustling main square. It’s nice to see that instead of going all contemporary with an over abundance of whites and sleek lines, the house retains its old world charm: the immaculate interiors are filled with antique furniture, gilt mirrors, oil paintings and chaise-lounges. Outside there’s a lush garden and pool area and stunning views of the mountains. The Salvia is more akin to staying in someone’s home than a hotel and that’s its charm. There are just 6 suites, no nightly turn down service, no hip bar or plethora of waiting staff. Instead there’s an honesty bar and an expert management team (Patrick, Sacha and Vanessa) who are always on hand when you need them (for recommendations on things to do, see and places to eat) but never in your face. Breakfast is served between the very civilised times of 9am and 11am and despite there being no restaurant, Vanessa whips up a selection of lovely lunches; we tucked into niçoise and orange, feta and herb salads with Vanessa’s homemade dressing - divine. Sóller is set in a verdant valley between the sea and the Serra de Tramuntana, a chain of craggy limestone mountains stretching the length of the northwest coast, from Andratx to Pollença. The town has a genteel, old-Mallorquin feel and at its heart is the attractive tree lined, Plaça Constituçio, which is as fine a town square as you’ll find anywhere in Spain. Dominated by St Bartholomew’s church on one side and with restaurants and cafés on the other, the square is a meeting place for locals and families, with children engaging in traditional games like riding in crates down the steps of the church! You can sit in the square watching life go by and then wander around the narrow lanes that weave off from the square, exploring ceramic shops and art galleries. A must-see is the Modernist museum, Can Prunera. 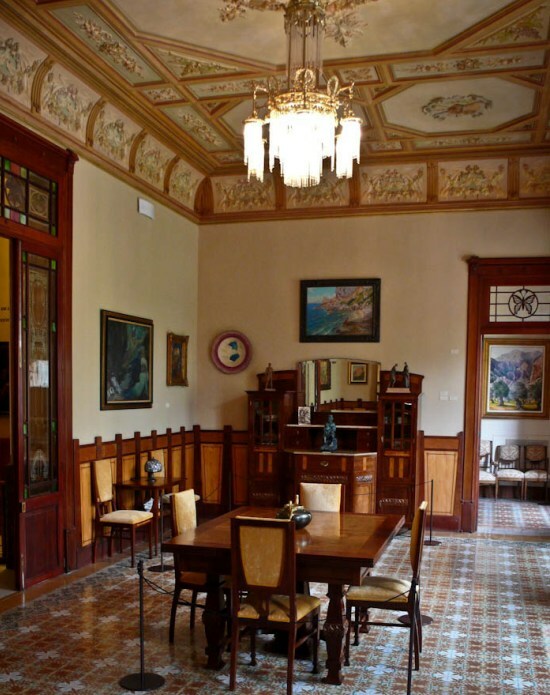 Set in a perfectly restored Art Nouveau house, the interiors with their period furnishings and exquisite detailing would be enough to make a visit worthwhile. However, that’s the added bonus of the collection of modern art on show from both regional and international artists. Sóller’s location is fantastic. If you want the sea,catch the pretty open sided wooden tram that trundles its way to Port de Sóller in about 20 minutes. The port, with its sliver of white sand and promenade, used to be a tired old seaside resort but over the years it’s had a face lift. There are luxury yachts in the harbour and swish restaurants fronting the promenade but, the whole place still retains a Spanish feel and has a laid back and less ritzy (in a nice way) feel than other ports around the island. If you want to experience the vibrancy of Palma, Mallorca’s capital, with its restaurants, arts and shopping, you can take the old wooden train that winds through the mountains. Leaving from one of the most beautiful stations I have ever seen, the train is just as beautiful with its wood panelling, inside and out, brass fittings and comfy leather seats. The journey takes about an hour and if you want a quicker route back, there’s an express bus that takes 30 minutes. For the more energetic I’d definitely recommend the walk up to Fornalutx, a cute picture postcard village on the hillside above Sóller. It’s a circular walk taking in the hamlet of Biniarix and the abundance of lemon and oranges groves which make the valley a stunning riot of colour. Fornalutx’s town square is matchbox tiny but packs a punch in terms of prettiness. Try to be there for lunch as the traditional fare on offer at restaurant Es Turó is definitely worth a stop and this, coupled with the stunning views down the valley from its terrace, make it a definite. Despite only four days away, we packed a lot in but didn’t feel rushed or exhausted, just well rested and relaxed. Sóller definitely adds up to a perfect short break destination: short flight and transfer, town, beach, mountains, walking and warm sun….ideal! We stayed in the Garden Suite at the Hotel Salvia which is on the ground floor overlooking the gardens and mountains. It has a huge bed, sitting area and beautiful bathroom with claw foot bath and separate enormous walk in shower. €230 per room per night, bed and breakfast (excluding 8% tax). Following recommendations from Sacha at the Salvia, we ate in Soller’s square at Ca’n Quirós, a family run restaurant serving up fantastic fish cooked in local styles - service can be slow but that’s part of the charm; Café Sóller which has great salads and also C’An Pintxo, a new place that has such a friendly owner and is doing something different with it’s pinchos offering (the Basque version of tapas). The Es Turó in Fornalutx is family run and does wonderful local dishes. In Port de Sóller we ate at the excellent Hotel Espléndido, which is also a great place to stay if you want to be near the beach and is very popular with families. The Can Prunera Modernist museum and one of Penelope’s deep tissue massages back at the Salvia.